Notice is hereby given in accordance with the provisions of sections 404–405 of the Local Government Act 1993 (NSW), that Council has developed its draft 1 year Operational Plan 2019/20.. The draft Operational Plan details the activities to be undertaken in the next financial year and includes the Revenue Policy and Fees and Charges. Council has resolved to rename the road in the locality of Goolhi. Residents are advised that the Coonabarabran and Coolah Offices, including Service NSW, will be closed Easter Long Weekend and ANZAC Day Public Holiday’s. On Friday, 5 April 2019, the river well level was 1.34 metres and the bore level was 8.25 metres. The supply source of water for the town water supply over the last week was Bore water. On Friday, 5 April 2019, the water level at Timor Dam was 20.26% of dam capacity. This is an increase of 2.46%, due to the recent rainfall fall. The Forensic Audit Report July 2018, prepared by Moore Stephens (SA) has been released to the public. The Coonabarabran Memorial Swimming Pool Advisory Committee has prepared a concept plan with proposed upgrades. Members of the community are invited to attend the April Council Meeting of Warrumbungle Shire Council. The meeting will be held at the Council Chambers, Coonabarabran, on Thursday, 18 April 2019, commencing at 8:30am. The draft Code of Meeting Practice for Warrumbungle Shire Council is currently on public exhibition. Since termination of the building contractor, Boulus Constructions, due to breaches of Contract, Council has been progressing through the site matters relating to the Three Rivers Regional Retirement Community (TRRRC) project at Dunedoo. The draft Code of Meeting Practice will be on public exhibition from Monday, 25 March 2019 until Tuesday, 23 April 2019 and can be viewed at Council’s Offices in, Coonabarabran and Coolah and at local Council Libraries during normal business hours. New Business Ideas Workshop is free for all local small businesses, contractors, service providers and community members who are interested in tapping into new industries adjacent to Warrumbungle Shire Council. Warrumbungle Shire Council has been successful in obtaining funding from the Office of Environment and Heritage to undertake a review of Council’s heritage studies. On Friday, 15 March 2019, the river well level was 1.30 metres and the bore level was 6.25 metres. The supply source of water for the town water supply over the last week was the river. The public swimming pool season for the residents of the Warrumbungle Shire is drawing to a close. Funding of up to $1 million has been announced for employment and infrastructure projects that will provide employment for people whose work opportunities have been impacted by drought. On Friday, 8 March 2019, the water level at Timor Dam was 17.9% of dam capacity. On Friday, 8 March 2019, the river well level was 1.40 metres and the bore level was 7.61 metres. Warrumbungle Shire Council is calling for application for Round Two of the 2018/19 Community Financial Assistance Donations. 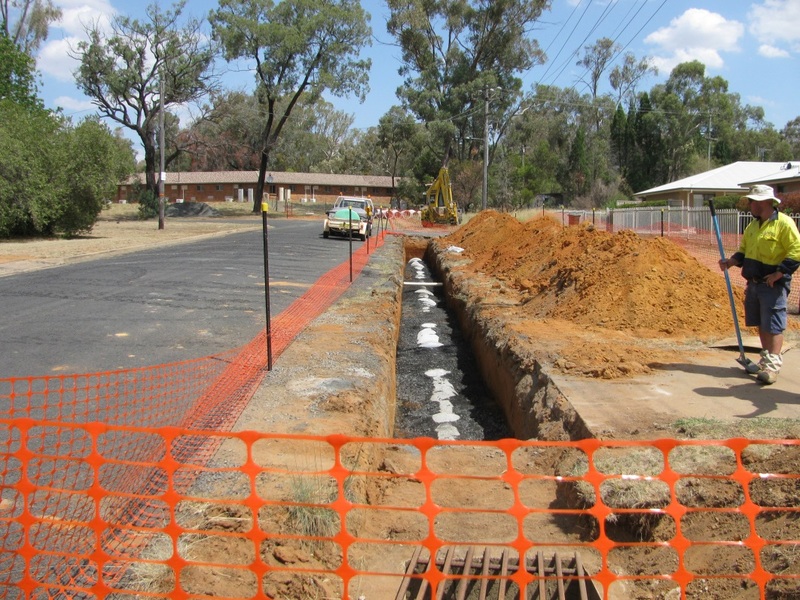 Major works have recently been taking place in Belar Street and Merebeen Street in Coonabarabran with new stormwater pipes being installed. Upgrade works to the guardrail on Baradine Road near the Railway Crossing Bridge are currently being completed. Take the opportunity to meet with Councillors, Senior Council Staff and other members of your community to discuss the issues affecting your local community. Thirty community groups from across Warrumbungle Shire will share in almost $15,000 worth of funding as part of Round One of Council’s Community Financial Assistance Donations. 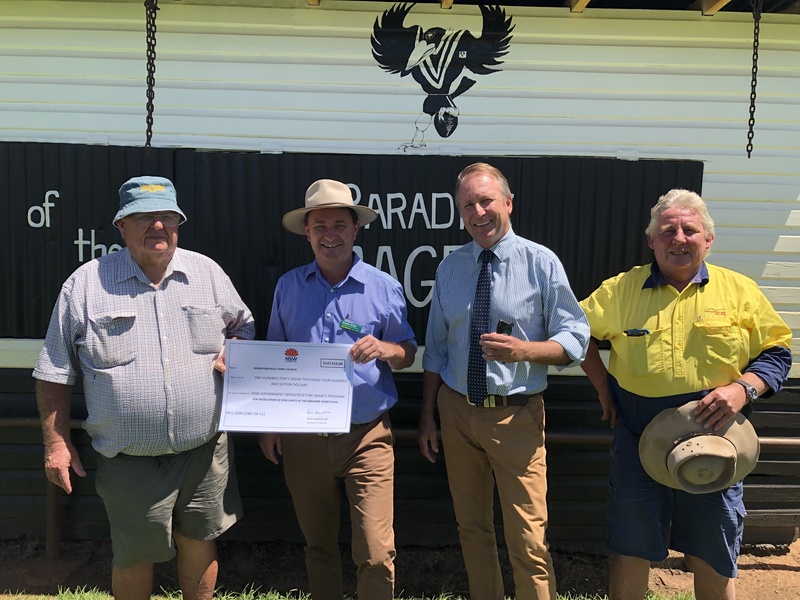 In welcome news for the Baradine community, funding for the upgrade of lighting at the Baradine Sports Oval has been announced. Warrumbungle Shire Council operates six public swimming pool facilities within the Council area at Baradine, Binnaway, Coolah, Coonabarabran, Dunedoo and Mendooran. 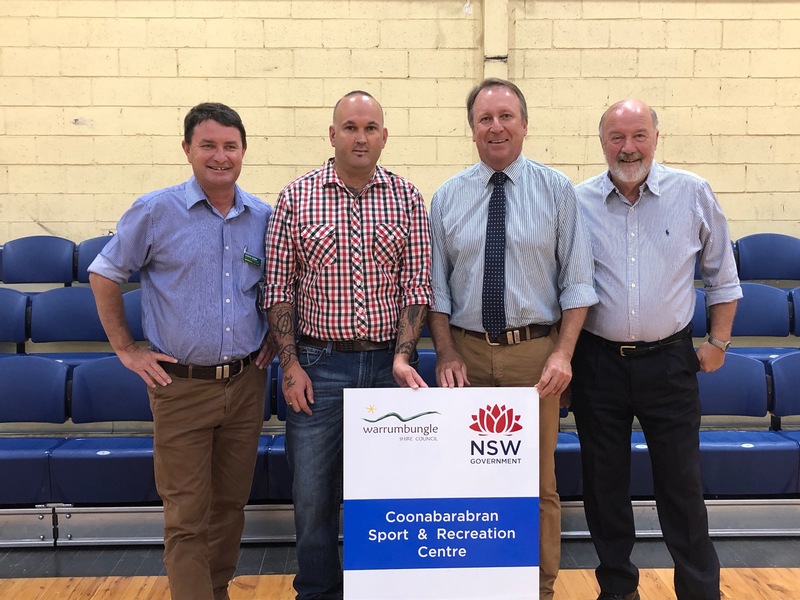 Members of the community joined Member for Barwon, Kevin Humphries, to officially re-open the Coonabarabran Sport and Recreation Centre following a series of upgrades completed with funding from the NSW Government Stronger Country Communities Fund. 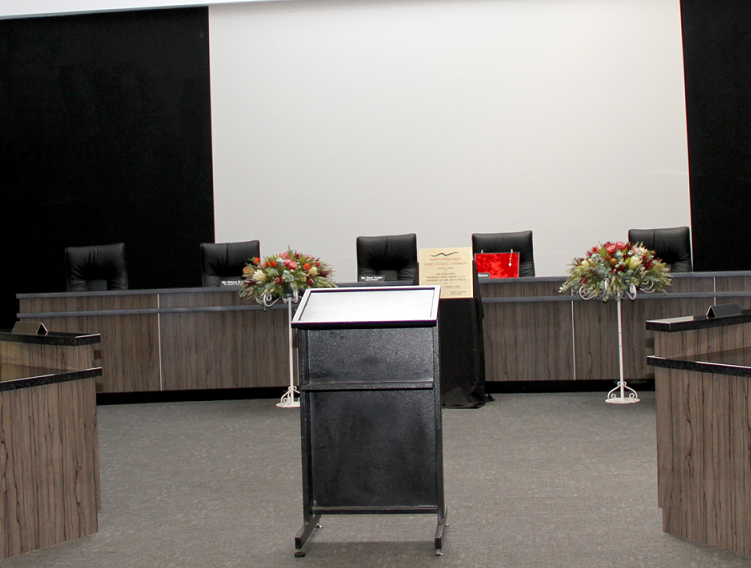 A public meeting of the NSW Local Government Grants Commission and Warrumbungle Shire Council will be held on Thursday, 28 February 2019 at the Coonabarabran Council Chambers. 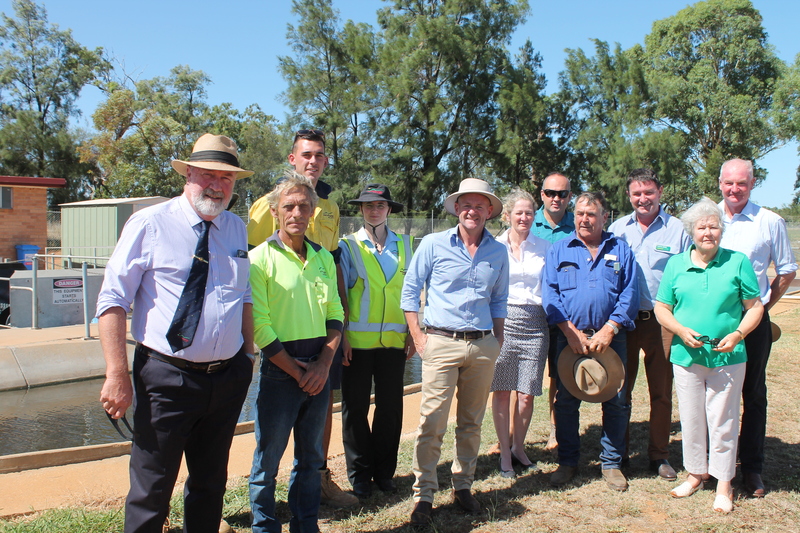 Earlier this week Minister for Regional Water Niall Blair visited Warrumbungle Shire to announce funding for four (4) projects as part of the NSW Government Safe and Secure Water Program. In December 2018, Coolah, Binnaway and Dunedoo was placed on an updated Level 2 and 3 water restrictions. Changes to these water restrictions were as a result of the adoption by Council of a Drought Management Plan. Council is aware of concerns expressed by a number of residents in Mendooran in relation to the recently implemented Level 6 water restrictions. Works will soon commence on the installation and upgrade of the onsite sewerage management system at the Binnaway Campground. On Friday, 1 February 2019, the water level at Timor Dam was 19.3% of dam capacity. Warrumbungle Shire Council is calling for community input in to the 2019/20 budget. Warrumbungle Shire Council is calling for requests for Annual Donations as part of Councils’ Donations Policy. On Friday, 25 January 2019, the water level at Timor Dam was 19.5% of dam capacity. A number of residents have today contacted Council in relation to concerns about the drinking water in Mendooran. 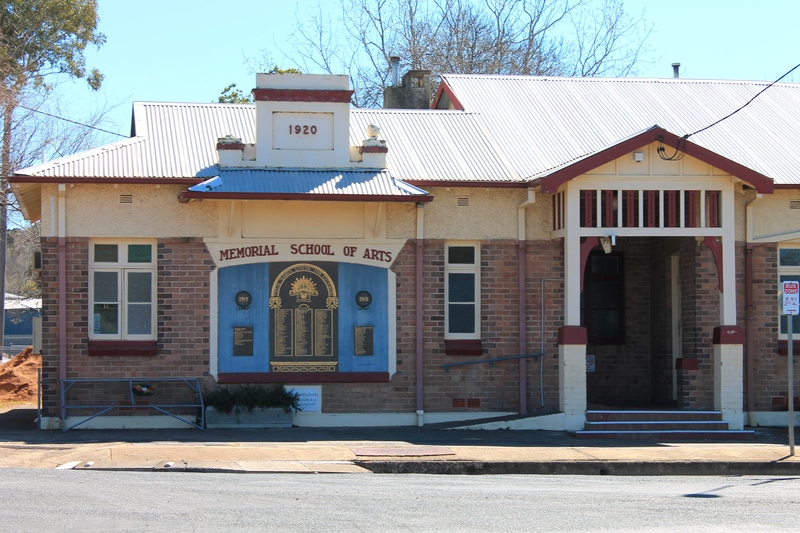 The School Holidays are coming to an end and schools in Warrumbungle Shire will begin to return from this week with the school year starting on Tuesday, 29 January 2019 in the Eastern Division and Tuesday, 5 February 2019 in the Western Division. Due to ongoing dry conditions, dropping river and bore levels and ongoing issues with algae, Mendooran is being placed on Level 6 water restrictions effective immediately. On Australia Day 2019 people in towns across Warrumbungle Shire came together to celebrate what’s great about our country, our Shire and our local communities. In January and February 2019 Council will be undertaking heavy patching roadworks on Bolaro Street, Dunedoo. The roadworks are being undertaken to maintain and improve road quality and safety as part of Council’s roads maintenance contract with the Roads and Maritime Service (RMS). The Boil Water Alert issued on 17 January 2019 for residents of Coolah connected to the town water supply has now been lifted. Following the detection of E. coli a Boil Water Alert was issued on Thursday, 17 January 2019 for residents of Coolah connected to the town water supply. The Alert still remains in effect. Residents are advised that the Coonabarabran and Coolah Offices, including Service NSW, will be closed on Monday, 28 January 2019, due to the Australia Day Public Holiday. With Warrumbungle Shire Council once again participating in the Australia Day Ambassador Program, Warrumbungle Shire Council Mayor, Councillor Denis Todd, has said he is looking forward to welcoming the Australia Day Ambassadors to Warrumbungle Shire. Strength testing of the weir over the Castlereagh River in Namoi Street, Coonabarabran is currently being undertaken by Warrumbungle Shire Council. On Friday, 18 January 2019, the water level at Timor Dam was 19.4% of dam capacity. Due to ongoing dry conditions and significantly increased demand Baradine is being placed on Level 1 water restrictions immediately. On Thursday 17 January 2019 a Boil Water Alert was issued for residents of Coolah connected to the town water supply, advising that E. coli bacteria had been detected. This Alert will continue to remain in effect while further action is taken to improve the supply and conduct additional sampling of the supply. Earlier this evening residents of Coolah were advised that E. coli bacteria has been detected in the town water supply. Residents of Coolah are advised that E. coli bacteria has been detected in the town water supply. Towns across Warrumbungle Shire are getting ready to celebrate Australia Day 2019. Since the termination of the contract with the builder, Boulus Constructions, Warrumbungle Shire Council has been undertaking works at the Three Rivers Regional Retirement Community (TRRRC) site to protect and weatherproof the structures. At the Extra Ordinary Council Meeting held on Friday, 4 January 2019, Warrumbungle Shire Council resolved to make an application to suspend the Service Approval for Castlereagh Family Day Care for up to 12 months. On Friday, 11 January 2019, the water level at Timor Dam was 19.7% of dam capacity. Work is underway on the construction of a new concrete footpath in Bandulla Street, Mendooran. Due to ongoing dry conditions and a sudden drop in river and bore levels Mendooran is being placed on level 5 water restrictions immediately. As a result of three new bores coming on-line in Coonabarabran, water restrictions have been eased to level 5 for the town. There was considerable activity in Bullinda Street, Binnaway in the lead up to Christmas with the staff from Warrumbungle Shire Council constructing kerb and guttering for a section of the street. Expressions of interest are currently being sought from suitably qualified people to be a member of Council's Internal Audit Committee. Council had previously advised that there would be changes to recycling collections due to the upcoming Public Holidays. With the ongoing dry conditions and dropping water supplies Warrumbungle Shire Council has announced new water restrictions for Binnaway, Dunedoo and Mendooran. With three new bores coming on line Warrumbungle Shire Council made the decision to ease water restrictions in Coonabarabran. Plans are being prepared for a proposed stormwater drainage project in Dunedoo. Local Police, pubs and sporting clubs throughout the Warrumbungle Shire area will be participating in the ‘Plan B Win a Swag competition’ initiative throughout December. At the December Council Meeting, Warrumbungle Shire Council decided on projects worth $1 million to be put forward under the Drought Communities Programme –Extension. Warrumbungle Shire Council is calling for submissions on the Warrumbungle Shire Council Draft Guideline for School Bus Routes and Bus Stops. On Friday, 7 December 2018, the water level at Timor Dam was 21.35% of dam capacity. Yuluwirri Kids Preschool in Coonabarabran is leading the way in safer play opportunities for their children, thanks to a $15,000 grant from the NSW Government to install a soft-fall space in the playground. To accommodate the future need at Coonabarabran’s Native Grove Cemetery and improve facilities for visitors, Warrumbungle Shire has recently carried out a number of upgrades and other maintenance works. On Friday, 30 November 2018, the water level at Timor Dam was 21.44% of dam capacity. Warrumbungle Shire Council is calling for nominations for the 2019 Australia Day Awards. The Warrumbungle Shire Council Australia Day Awards are run in conjunction with the NSW Local Citizen of the Year Awards. Each year residents of Warrumbungle Shire are invited to nominate fellow citizens for the Warrumbungle Shire Council Australia Day Awards. Council is inviting tender submissions from Contractors and Plant Hire Companies for the supply of hire plant on a casual basis. Warrumbungle Quarry is running an end of year special on Blue Metal Dust. The following stock will be auctioned on Monday 3 December at 8:30am at Council’s Stock Pound in Namoi Street, Coonabarabran. Households across the Shire are being encouraged to take part in the upcoming Household Chemical Cleanout. This annual event is an opportunity for people across the Shire to safely dispose of potentially hazardous chemicals around their homes. On Friday, 16 November 2018, the water level at Timor Dam was 21.05% of dam capacity. Warrumbungle Shire Council is now recruiting for current school students to participate in a School Based Traineeships program commencing in 2019. On Friday, 16 November 2018, Federal Member for the Electorate of Parkes, Mark Coulton, joined Warrumbungle Shire Council Mayor, Councillor Denis Todd, to officially open Allison Bridge on the Black Stump Way at Coolah after extensive upgrade works. Warrumbungle Shire Council is calling for applications for Round One of the 2018/19 Community Financial Assistance Donations. 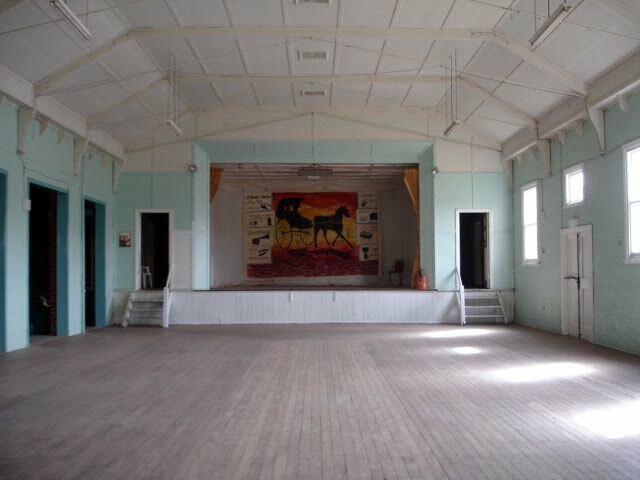 In exciting news for local residents, Warrumbungle Shire Council has announced that a Community Based Heritage Study will soon be taking place across the Shire. Due to ongoing technical issues towns throughout the Warrumbungle local government area are not having fluoride added to their supply. Works on the next stage of the Goddard Street Shared Path Project is nearing completion. In welcome news for the Binnaway community, funding for the upgrading of the lighting at Binnaway Oval has been announced. Pursuant to the Local Government Act 1993, Warrumbungle Shire Council gives notice that on Thursday, 15 November 2018, the business of the Ordinary Council Meeting will include the presentation of the audited financial statements and the Auditor’s Report. The Warrumbungle Council administration building in Binnia Street, Coolah, will be receiving some much needed structural updates over the coming weeks. On Friday, 2 November 2018, the water level at Timor Dam was 21.35% of dam capacity. 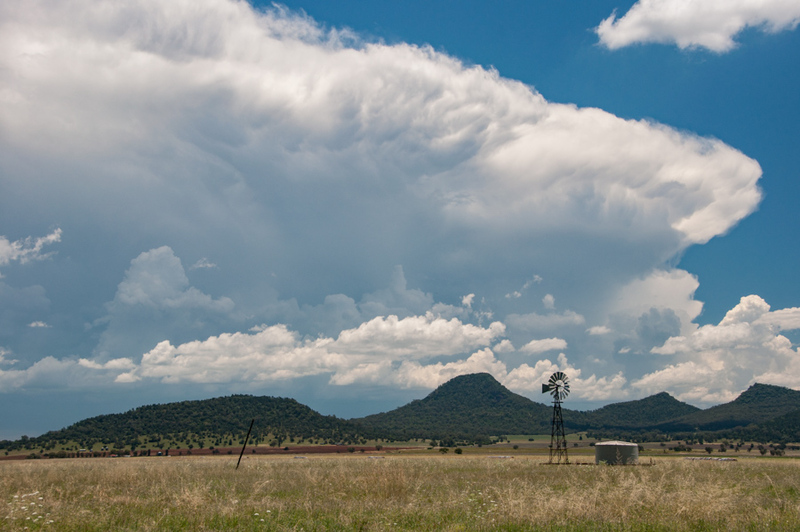 Warrumbungle Shire Council is seeking input from the community about how funding being provided under the Drought Communities Programme should be spent in Warrumbungle Shire. On Friday, 26 October 2018, the water level at Timor Dam was 21.56% of dam capacity. On Friday, 19 October 2018, the water level at Timor Dam was 21.56% of dam capacity. On Friday, 12 October 2018, the water level at Timor Dam was 21.4% of dam capacity. On Friday, 5 October 2018, the water level at Timor Dam was 21.5% of dam capacity. Warrumbungle Shire Council is calling on members of local communities to let us know your ideas for projects to be funded under the Drought Communities Programme.